SOME 302.73 million shares worth RM683.84 million changed hands off market, in blocks of at least 450,000 shares from Sept 10 to 15. Matrix Concepts Holdings Bhd saw 13.74 million shares or a 3.01% stake traded off market, between Sept 10 and 12. The transactions were priced at between RM3.20 and RM3.25 apiece, slightly lower than the open market prices on those dates. According to filings with Bursa Malaysia on Sept 11 and 12, two large blocks totalling 10.23 million shares were disposed of by Matrix Chief Operating Officer Ho Kong Soon. The shares were taken up by institutional investors in a direct deal. The company’s stock price has more than doubled since its initial public offering in May last year, buoyed by the success of its property projects in Negeri Sembilan. The counter closed at an all-time high of RM3.32 on Sept 09. Instacom Group Bhd CEO Anne Kung Soo Ching sold 15.1 million shares or 2.15% equity interest, worth RM3.32 million, in a direct deal on Sept 11. The transaction was priced at 22 sen apiece, marginally lower than the counter’s closing price of 22.5 sen on the same day. The sale leaves Kung with a 10.95% stake or some 76.9 million shares in Instacom. While the share performance of the telecommunications infrastructure company has been flattish since the beginning of the year, its earnings in the first half of its financial year 2014 ending Dec 31 were weaker, with net profit tumbling 57% year-on-year to RM6.21 million. On Sept 11, Cuscapi Bhd saw 8.04 million shares or 1.8% of its total shares outstanding, traded off market. The single direct deal was priced at 40 sen apiece, which was at a steep 21% premium to the stock’s closing price of 33 sen on the same day. At their close of 32 sen on Sept 17 (Wednesday), the shares of the business solutions provider, which reported a wider net loss of 2.89 million in 1HFY2014, had declined 20% from Jan 01. Another notable off-market transaction was seen in Genting’s warrants, Genting-WA, on Sept 11. A large block of 9.79 million units representing 1.31% of the company’s total issued warrants, worth RM27.92 million, was traded at RM2.85 apiece. Genting-WA closed at RM2.71 on the same day. The group recently proposed a RM5 billion medium term note programme for capital expenditure and the development of properties and resorts, including those in Genting Highlands. In 2QFY2014, Genting reported a 20% y-o-y decline in net profit to RM372.07 million, which was mainly due to a lower contribution from its leisure and hospitality unit. According to filings with Bursa, 9.15 million of PDZ Holdings Bhd’s shares were traded off market in 12 different transactions, from Sept 10 to 15. 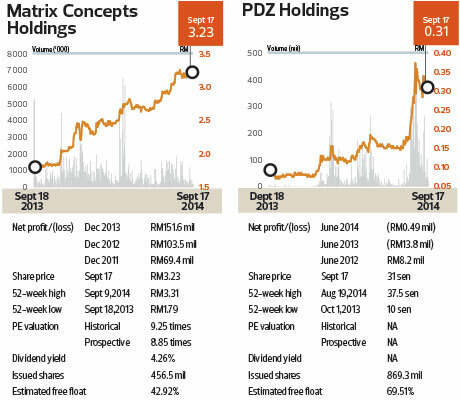 The trades, representing 1.05% of PDZ’s share base, were worth a total RM2.95 million. While the identities of the buyer and seller have not been announced to the exchange, on Sept 08, PDZ’s major shareholder Pelaburan MARA Bhd inked a share sale agreement with Megalink Industries Sdn Bhd, for the sale of 128.02 million shares or 14.73% of PDZ’s share base. The stock had rallied prior to the announcement and gained 51% from Aug 08 to Sept 17, when it closed at 31 sen. The company, which is shifting from shipping management to oil and gas, is in the midst of acquiring vessel operator Efogen Sdn Bhd in a RM18 million deal.